Pressure cook the Split gram dAl adding 1 glass of water and a little turmeric powder. Extract the juice from tamarind by adding 1½ cups of water and keep aside. Take oil in a kaDAi and fry the red chilli, coriander seeds, Bengal gram dAl and fenugreek till they release a fine aroma and become golden brown in colour. Remove and grind these with the shredded/grated coconut (do not fry coconut but use in raw form) coarsely without adding water. Keep aside the masAlA powder. Heat oil in a pan and add mustard. When it starts spluttering, add peeled onion (in the case of medium sized onions, the cut pieces). Close with a lid, simmer the flame and sauté for 10 minutes, sprinkling water in between, to prevent the onion charring. Add the tamarind extract, salt and turmeric powder. Let this boil for 5 to 10 minutes. Mix the masAlA powder with the cooked dAl and add to the above allowing the whole to boil for another 5 minutes or till the required consistency is attained. Switch off the flame. Add 1 tablespoon of ghI and mix. In this also, I add ½ tsp sugar, to enhance the taste and balance the sour taste. 1. We can replace onion with other vegetables like drum stick, radish, ash gourd, pumpkin, bitter gourd and brinjal. 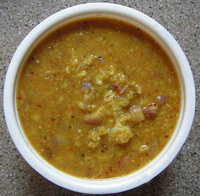 When we use bitter gourd, the sAmbAr is known as “PAgaRkAi PitLai“. We should add whole white (KAbUli) chanA or split Bengal gram dAl (chanA). In the case of KAbUli (VeLLai mUkku kaDalai) chanA, you need to soak it at least for 8 to 10 hours before using. The bitter gourd is cut into pieces after removing the seeds (if they are hard) and pressure cooked with ¼ tsp salt and a little turmeric powder and washed split chanA dAl, if it is used in place of KAbUli chanA. It is then added to the tamarind extract after the mustard splutters. Some people sauté the bitter gourd pieces with a little more oil along with the mustard for 10 minutes till they become crisp and brown, in case the bitter gourd is too tender, and then add tamarind extract, salt and turmeric powder. 2. In case you use ash gourd or pumpkin, follow the procedure mentioned for normal sAmbAr for boiling and adjusting the tamarind extract. They should be cut into big pieces. 1. Curry leaves give better aroma to sAmbAr than coriander leaves. However we do not add curry leaves as well as asafoetida to sAmbAr made with ash gourd, drum stick and radish. 2. Camphor cubes are said to drive away ants and cockroaches. Keep a few wherever you find them. Also if you keep a few cubes of camphor on a plate, in a corner of your bedroom, an hour or two before you go to sleep, not only the ants and cockroaches but also mosquitoes will run away. 3. For all steaming purposes it is essential not to put the weight in the pressure cooker, especially for kozhukkattai, idlis puttu and idiyAppams. The weight is required for pressure cooking tough items like rice, vegetables dAls and rice uppumA. Keep the weight back on the lid itself so that you need not search it. 4. For a longer life of gaskets in the pressure cooker, keep them in cold water after you use it for cooking so that the hot expanded gasket comes back to its original shape. After it is cooled, wipe it dry and place it back in the lid. Similarly wherever you use gaskets or rubber rings like in the case of mixie, you must keep them back after cleaning so that you need not search them. This entry was posted on March 11, 2011 at 11:01 pm and is filed under SAmbAr with tags asafoetida, ash gourd, Bengal gram dal, bitter gourd, camphor, coriander leaves, coriander seeds, curry leaves, drum stick, fenugreek, festival, gasket, grated coconut, Kabuli chana, marriage, masala, mustard, onion, pagarkai pitlai, pressure cooker, pumpkin, radish, red chilli, salt, sambar, sambar powder, shredded coconut, split gram dal, steaming, sugar, sumangali prarthanai, tamarind, turmeric powder, vegetables. You can follow any responses to this entry through the RSS 2.0 feed. Both comments and pings are currently closed.